An Endeaver To Transform Reality. Aries looks around. Always impressed with the sized and feel of the Centre. Constantly full of gratitude for all that it offers. “uh-huh…” Aries gets the feeling a new lesson is on it’s way. “I’m not sure what you mean by that… Encumbered by belongings. What are you talking about?” Aries says as he spots the collection of longboards and heads towards them. “Why do you say that?” The Dragon asks. “It would be so frustrating. Having all these really cool things around. Sitting right in front of your face, but not being able to access them. That is, unless you do something to earn money to then buy them. Then what? When your done with the item you have to lug it around everywhere? Pay to store it or try to sell it. However, When you sell the item you never get back the same amount of money that you spent on it. So, if you want to access something else you have to go back to work and earn more money. Sounds like a bad dream to me” Aries spots the board he’s going to take for the day and heads over to pick it up. Aries stood there frozen holding the Longboard in his hands, his mind racing, trying to keep up with what Uta was saying. And, with those last words Aries pushes off. Heading down one of the trails towards Commercial and Broadway. During the intelligent redesign of the city some key infrastructure was left intact and maintained over the years. The sky-train network was one thing that survived from the old city that was once known as Vancouver. Aries grabs a harness and clips in, then walks over to a deck that extends out past the edge of the roof. He looks down. Over a hundred and fifty meters to the ground. A wave of discomfort washes over him causing his feet and palms to sweat. Damn crazy people, he thinks to himself. Who was in charge of the transportation design of this city? They obviously were adrenaline junkies… He tries to focus his attention on the landing strip at the end of the zip line. It’s out of sight, but he knows exactly where he’ll touch down. He’s taken this Zip-line hundreds of times and every time arrives safely in the Access Centre. He takes a deep breath. “Ok,” he says out loud and pushes off before his mind can collect any more irrational fear. Wind rushes past as he speeds over Oldvan. A city redesigned years ago to accommodate a world of thrill seekers. It’s early and not many people are out yet, but Aries notices a small group. Perhaps a young family or some friends climbing up one of the neighboring skyscrapers. Even this early in the morning it’s common to see people using the climbing gear attached to some the tallest structures in the city. Seeing this inspires Aries to think of all the people that spend their whole lives traveling the world and experiencing its thrills. People from all around the planet come to experience what Oldvan has to offer. There are rock climbing walls up skyscrapers. Some are even connected with transparent bridges and have bungee jumping platforms on them. was the statement he left in his review. The simulation even covers the transition that came during the end of them monetary age in great detail. It allows people to see the deconstruction of the greater Vancouver area as it’s older and hazardous buildings were mined for their resources. During this time a large majority of the paved roads and overpasses were torn up and used in new construction methods. The simulation shares exactly how everything was done and it was done in a very thought out and efficient manner. Aries speeds over and under a network of zip lines and above the countless kilometers of trails converted from the roads and highways. The old city is crisscrossed with Zip-lines. Towers act as part of the transportation system usually having 3 to 5 directions to head via Zip-Line. Some people use them for quick and efficient transportation, others for fun and excitement. Using zip-lines save the city from having to create excess power for transpiration as zip-lines only need gravity to function. The city is loaded with thrills, events, and trails. Life blossoms everywhere. On the roofs, green vegetation grows vibrantly. Mostly food plants and others that are useful in some way. Aries snaps out of his deep thought when he spots a small school of kids on a large garden roof. One starts to wave at Aries as he races by, the others soon join in. Aries gives them a little nod, salute and then assumes a heroic flying pose. He knows them. They’re a group of young kids that are very interested in growing food. They are being taught the old ways of growing food in soil. The group is led by a couple passionate elders that once helped Aries to understand the amazing function of seeds and the interconnectedness that humanity shares with the natural environment. They have come by Vertical Roots a couple times and Aries had the opportunity to show them around. Vertical roots is just one of a number of vertical farm installations in the city. Together they grow and produce a large portion of the food required to feed the cities population of around 3 million. The rest of the food is grown with the help of countless smaller operations and the large outdoor farming operations in the valley. Oldvan like most other cities creates the majority of its power locally. Solar panels line skyscrapers and being a coastal city Oldvan implements the use of tidal forces to meet a large portion of its energy needs. Altho Oldvan offers a lot of interesting activities and attracts millions of travelers it does fall short on manufacturing and educational opportunities. Oldvan is a city built to thrill and excite people more than anything else. That’s its focus and that’s what it does best. But, Aries is a creative type and he finds himself wondering why he has spent so much time here. Coming close to the end of the line Aries can see the Access Centre now. It’s a marvels structure constructed with new methods. Perched on a hill with multiple zip lines coming into and around it. Trails leaving in all directions from it. Aries glides into a large opening and is gently slowed by the automatic system. Once stopped the automation plucks him off the cable and places him standing on the floor. It then unclips him from the harness and takes it away for others to use when needed. Aries heads over to the food dispensers underneath the sunshade to have some breakfast. There is a lot to choose from. Aries orders a blueberry muffin, a peach, and some yogurt. The food dispenser begins to prepare the food. It ejects muffin mix into a cup and starts to quick bake it right in front of Aries’ eyes. While the muffin bakes the automated machine fills a bowl of yogurt and then slices a peach placing it in a circular arrangement neatly on top. The muffin finishes moments later. The dispenser then places everything on a tray and hands it over. Aries holds in front of him a steaming hot muffin right out of the oven and a bowl of mouthwatering peachy yogurt prepared in mere moments, but something is missing. “Thanks, Dips!” Aries says with a hint of irritation. He knows the dispenser is just automated to interact with people in the way it does so that they are aware and don’t burn themselves. But, he’s been hearing the same warnings day after day for a couple years now. He sits down at a table and notices the two boys playing a float game in the skydiving simulator. The particle directing device has spawned some sparks, and the boys are trying to dodge them. It’s a pretty fun game and can get challenging on the higher levels. Stars is new to this so Leif started the game at level one. 3 watermelon size Sparks moving in a predictable pattern. Childs play for anyone that knows how to maneuver themselves in the air. Leif try’s to show Stars how to move up and down, tilt left and right, back and forth all well dodging the sparks. A Good teacher and a good student. Stars picks it up quick. Before long they reach level two and then level three. Leif and Stars are now bouncing off the walls. Jumping, Flipping, Spinning with sparks orbiting around faster and faster following their predictable patterns. Aries finishes his breakfast, but can’t take his eyes off the two. Now at Level four, there is 9 watermelon sized sparks and two larger sparks spiralling up and down the centre of the skydiving simulator, creating what looks similar to a DNA strand. The speed and growing numbers of sparks finally catch up with stars lack of experience. As he tries to avoid a spark he drops right onto another. The sparks impact looks painful as it explodes in a bright light sending him spinning with kinetic energy. Just as he regains his composure on the wall a second watermelon sized spark connects with his shoulder and again he is sent flying out of control. This time bouncing off the wall before flattening him out, which then causes him to rise in elevation. Leif sees his cousin floating out of control heading straight for one of the larger orbs in the centre of the simulator. He reacts quickly. Adjusting his pitch, diving in altitude, surpassing the central orb that is on a collations course with stars. Leif makes contact with stars and pushes him out of the way, but as he does the central orb comes down on him. KaBoom!!! It sends Leif flipping head over heels and releases three smaller sparks. Aries’ eyes are open wide as he watches one of the smaller sparks makes contact with stars for the third time. Three hits and your out. Aries has played the game many times and is rather good at it but he doesn’t spend much time watching others play. It’s quite spectacular. The fans slow and the boys touch down. “That was Awesome!” Stars yells with excitement. “Let’s go again!”. Leif response to his cousin, but Aries cannot hear him. The fans start up and the two boys begin another round. Aries could watch these guys a bit longer but more interesting things are seeking his attention. Aries belongs to the creator class of humans. These classifications are self-given and flexible. At anytime people can change their classification. This allows people to evolve and grow freely with their developing interests. As a creator Aries has more responsibilities than a lot of people. But, these responsibilities come with perks such as having access to resources that others do not and he’s able to acquire new technology before it is mass produced. Thoughts are interrupted by Uta’s voice. Aries stands up, stretches his back, takes one more look at the boys flying around above the green city and heads to the zip line that is running towards the personal transit access center. or Check out this video on indoor skydiving by the Wall Street Journal. New Discoveries are made daily. All pointless, unless something is done with the knowledge. Aries flips and bounces off the glass walls in the simulator getting himself to a high spot where the sun shines through the helmet’s visor. The suit he wears stops any uncomfortably cold wind but lets in the warmth of the sun. Uta projects himself into the cylinder through the main controls particle director system. The little dragon catches the wind and whips past Aries, he then maneuvers himself directly above, Which causes him to drop onto Aries back. Aries can feel UTA’s little paws touch down thanks to the physically interactive nature of this particular particle projecting system. Soon Uta finds a comfortable spot perched on Aries upper back. “Can you play me an audio bite now?” Aries asks as they float together looking out over the city. The video ends and Aries is interested just as Uta predicted he would be. “This old guy… who was he?” Aries asks. Then flips into a ball and drops in altitude before opening his body to lay on his back and look up at the morning sky. Uta had pushed off giving Ares space for his maneuver. He then floats himself into a position above the boy and lands sitting on his belly. “His name was Jacque Fresco, a major world changer. His life’s work gave human civilization the chance it needed to pull itself out of the monetary age. He was an inspiration for millions” Uta responds. “To be honest I’m not entirely clear why you shared this with me. What’s it’s relevance?” Aries looks at the dragon perched on his chest. Aries roles onto his belly sending Uta free floating. The sun now shining over Oldvan. Gently warming the tops of buildings and feeding the trees and other greens perched on them. Aries looks out over the city and is curious to learn more about the monetary age and how it came to end. Aries has never known money as an obstacle. He, like everyone else, has access to everything they need. Appropriate housing, healthy food, clothing, tech, toys, tools, games, education, everything. This was made possible through a new social economic system based on access as opposed to the monetary method of ownership. This new type of economy allowed for a very high standard of living for every human on earth while simultaneously creating a civilization of sustainability and respect for the natural world. Uta’s projection vanishes and the fan speed slows. Aries lands smoothly and exits the simulator. He takes the helmet off ‘Good morning for a jump!” he says to greet the others. “Sure is” the taller teenager response. “you’re up early” a new face adds in. Aries slips out of the suit as the taller teenager speaks again. “That’s why we call him early Aries,” he says with a big smile on his face and a hand on Aries’ shoulder helping him balance. “haha, whatever Leif, you just made that up. But, ya It’s the sunrise. I like to catch it. Here this will fit ya” Aries says as he hands over the suit to the new kid. “My dragon knows how best to get me moving in the morning.” Aries swipes Uta out of the control center and holds him up to be inspected. “Spacity…” The newbie responds as he slips the jumpsuit over his smart clothes. “Well nice meeting you Aries, See you around I’m sure” Stars then plugs his personal AI into the simulators control system and heads into the wind. Leif is suited up“Catch ya later Early Aries,” he says with a grin and a wink. He then follows his cousin into the massive cylinder before Aries can say anything in response. Alternative perspectives change the world. If you find some that make sense, support them. Share them and know you’re directing the future. Aries mumbles peacefully. The Unlimited Teaching Assistant proceeds to open the blinds through its connection to the smart environment. Soft morning light fills the room. Aries rubs his eyes briefly, then asks. “Uta can you play an audio bite?” his eyes are still closed as he makes the simple request from the little digital dragon. “Ya, oots… It’s hard to forget when you keep reminding me.” Aries eyes slowly bud to see Uta projecting a hologram of the skydiving simulator. Aries imagination was captivated by dragons when he was younger. It was an easy decision when prompted to name and customize his personal AI. 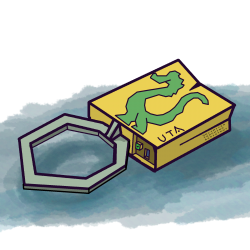 Now when his unlimited teaching assistant, Uta is projected or rendered through any interface it takes the shape of a cute snake-like dragon. He springs out of bed and reaches for the sky, yawning well he stretches his back and arms. 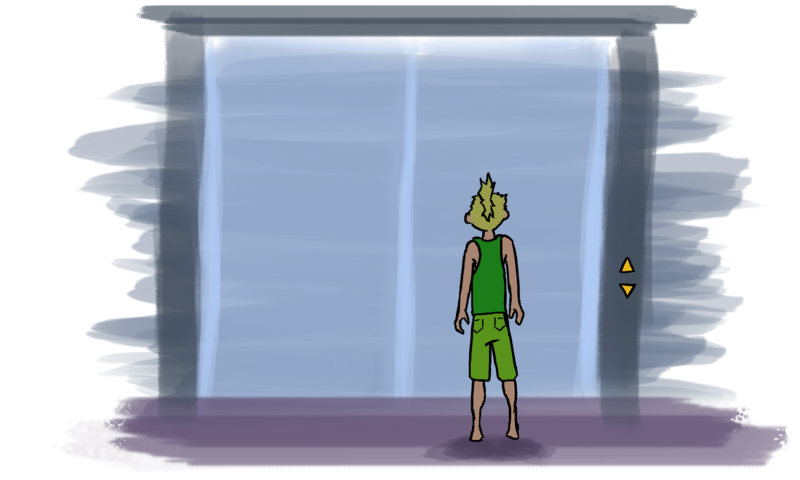 The hologram of Uta moves back quickly to give the boy his space. “I had another dream about the past,” Aries says in a distorted yawning voice as he scoops Uta’s chip out of the particle projector. Uta’s Holographic projection disappears. Aries slips the small piece of tech into the pocket of the shorts he has on and grabs the self-cleaning shirt off the floor. He has been wearing the same shirt for about 2 years. He doesn’t think much anymore of all the work and brains that had gone into these clothes, but he sure appreciates the fact that he only needs one pair and never has to spend time cleaning them. It’s just one of the many things that make’s his life simple. “You are having a lot of dreams about the past. This is the 3rd in a row. 9 in the last two weeks. Why do you think this is?” Uta’s question can be heard clearly even though he was unplugged and is bouncing around in a pocket. “Were you talking with people from the past about the future again?” Uta tries to help Aries figure himself out by asking thought-provoking questions. “What did you say to them?” Uta probes with another question. “Well… I was trying to talk to them about the opportunity they have to live a life that could greatly affect the future of humanity. A life so important and meaningful. I would give anything to live a life with such opportunities and challenges.” Aries spoke with a hint of disappointment in his voice. The door opens. Aries exits onto the top floor of the skyscraper. He is slow to move as he heads up the stairs to the roof. As he drags his feet his thoughts drift to how much more meaning his life could have had if he lived in the final decades of the monetary age in the early 21st century. Aries walks over to the edge of the skyscraper. Facing the direction of where the sun is about to rise. He pays little attention to the silhouetted forest city. Instead, he focuses on the glowing horizon for a few moments before turning around and heading towards the giant glass cylinder. As he walks up to the massive machine he pulls Uta out of his pocket and plugs the chip into the control center. Then reaches for the suit and helmet that fits him to a T.
The vibrations progress into a loud hum as the fans accelerate up to speed. A moment later he pulls the helmet on. His ears thank him. He quickly opens the door and jumps into the skydiving simulator to catch the rising sun.